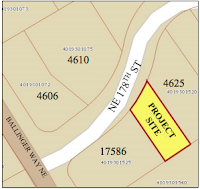 The City of Lake Forest Park Planning Department has posted a Notice of Application for Major Tree Removal for construction of a single family home. Trees proposed for removal include four significant trees and two landmark trees. One tree has a diameter at chest height that meets one criterion of exceptional but fails to meet the full definition due to a high risk rating, based on findings by certified arborist. Another tree has a diameter at chest height just under the threshold for exceptional and has a moderate risk rating with significant consequences, based on findings by certified arborist. The applicant’s proposal is still under review. Replacement canopy may be required pending city arborists’ report. Click here to see full Notice of Application with the location of the proposed trees for removal. Interested parties may comment on this application by submitting written comments to Lake Forest Park City Hall, 17425 Bothell Way NE, Lake Forest Park, WA 98155 or via email to aplanner@cityoflfp.com for two weeks following February 1, 2018. 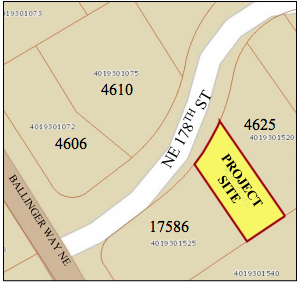 Additional information may be obtained by contacting the Lake Forest Park Planning Department at (206) 368-5440. Materials related to this proposal may be reviewed at City Hall Monday - Friday 9:00 am - 5:00 pm. Contact Lauren Hoerr, Assistant Planner, if you prefer to make an appointment to review the materials with a planner’s assistance.